BANFF, ALBERTA, Canada – Welcome to Lake Minnewanka in Banff, Alberta–a land boasting beautiful vistas, views of the Canadian Rockies, and the famous ‘Banff Crasher Squirrel.’ Just a 15 minute drive from downtown Banff, Canada, Lake Minnewanka can be toured by cruise. This sightseeing tour is available on one of two 48-passenger Lake Cruisers or on board the larger 65-passengar Alberta Explorer. All three ships operate throughout the day from mid-May to mid-October. 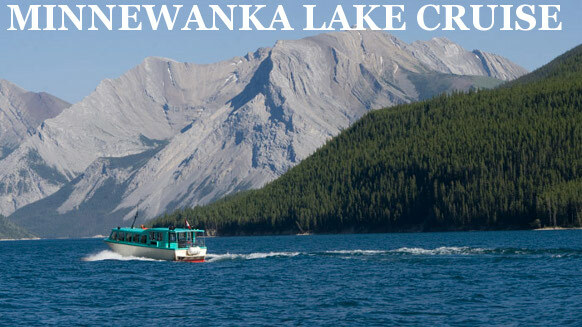 This magnificent interpretive lake cruise of Minnewanka and the scenic Canadian Rockies is just over one hour and provides unique photo opportunities unavailable elsewhere. Our experienced crew will guide you through this rugged paradise richly steeped in history, native folklore and geology. The narration is intriguing, entertaining and informative. You will learn about the wildlife and vegetation that inhabit these mountains, the early explorers who named them and the tremendous forces that created them. The Lake Minnewanka valley offers some of the most interesting and spectacular scenery found anywhere in the Canadian Rockies. Explore the largest lake in Banff National Park on this magnificent one hour interpretive cruise that introduces the rugged paradise richly steeped in history, native folklore and geology. Travel on a modern Lake Cruiser, as an experienced captain and entertaining guide explore the ‘water of the spirits’ and share tales of First Nations people and early explorers that first discovered the area. Learn about the tremendous forces that created the surrounding mountains and stay on the lookout for wildlife that frequent the lake. Lake Cruisers depart hourly on the hour between 10am and 6pm (last departure – evening wildlife cruise). Plan your Canadian Rockies vacation today, and join us out on Lake Minnewanka! Your family and friends will love it. A cruise on this beautiful lake provides a unique sightseeing tour experience, with the chance to see some of Banff’s most amazing peaks and wildlife, and to learn about the history of this amazing park, the first in the Canadian Rockies.